As promised, state Senate leaders rolled out additional “highlights” of their budget plan Tuesday afternoon. The plan, as explained by Senate President Phil Berger, “dramatically” increases teacher pay, expands the state’s controversial private school voucher program, hires close to 1,000 additional first- and second-grade teachers to reduce class sizes, and “fully funds” teaching assistants, in addition to other provisions. The teacher pay provision has already provoked very skeptical responses from some groups. Lawmakers said a full copy of the plan will be available on the N.C. General Assembly’s website at some point tonight. Among the most pivotal points in the plan, Senate lawmakers said their budget should elevate average teacher pay, with local supplements, to about $54,000 over the next two years. 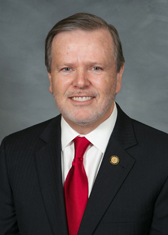 Senate Majority Leader Harry Brown; R-Jones, Onslow; said the raise would lift the state’s average teacher pay to tops in the southeast, although that’s likely assuming no other states in the region boost their teacher pay. “We just prioritized the teacher pay raises in a different way than the governor or the House did,” said Berger. One point Tuesday that’s likely to rankle many public education and progressive advocates: Brown said the budget plan will set aside $34 million in a reserve fund to expand the controversial Opportunity Scholarship Program. Brown said the funding will open up the private school vouchers to another 20,000 students over the next decade, despite criticisms from some that the publicly-funded scholarships may be funneled to religious schools with apparently discriminatory practices. As expected, Berger said the Senate budget differs most sharply with the House as it relates to teacher pay and tax cuts. The Senate leader said his chamber would pay for his big-ticket items with recurring funds coming from incoming revenues. We’ll continue to follow the Senate budget as it develops. The chamber’s appropriations committee is expected to meet tomorrow morning at 9 a.m. to discuss the plan.